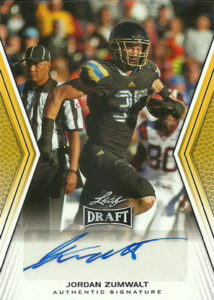 Jordan Zumwalt played linebacker at UCLA from 2010 to 2014. He finished his time at the college with 216 total tackles (141 solo, 75 assisted), 20 tackles for loss, 5 sacks, 3 interceptions for 56 yards- taking one to the house for a TD, and one forced fumble. Considered an over achiever, teams thought he needed to polish his game at the pro level, but could easily find himself a home as a special teams player or backup linebacker. The Steelers selected Jordan in the 6th round of the 2014 NFL Draft. He spent both 2014 and 2015 on injured reserve. In 2016, Zumwalt hit the field in the preseason and coaches were impressed by his play- however he was waived during final cuts. I don’t know why but I got thoroughly turned off by Leaf after 2014, however for me it may have had something to do with risk versus reward, them floating ‘wood’, or a bit of me just being plain greedy. Point being is when I go spend my shrinking budget dollar, it goes typically to either Sage or Leaf. In the end Sage won that battle. So other than design what became the main driving factor between my choices? Well quality of name would be next- but when the quality is the same- it simply came down to quantity and Sage trumped Leaf in spades. Sage offers 3-4 autographs per box as opposed to Leaf which offered just 1-2 for the same price point.